16 "Teach-In on the War"
Professor Howard Zinn (1922-2010) of Massachusetts was listed as a sponsor of the Niebyl-Proctor Marxist Library in Oakland California. Documents obtained under the Freedom of Information Act from the FBI revealed that Howard Zinn had been a secret member of the Communist Party USA (CPUSA) in the 1940's-early/mid 1950's. Cliff Kincaid, the top investigative journalist for the AIM Bulletin Accuracy In Media, got these documents which revealed Zinn's extensive CPUSA/fronts activities and published a major story in the AIM Bulleting, July 30, 2010, "Leftist 'Historian' Howard Zinn Lied About Red Ties." This report can be found on the AIM website. July 29-August 6, 1962 the World Youth Festival was held in Helsinki, under the auspices of the Soviet front World Federation of Democratic Youth. Willard Uphaus, supporter of Communist fronts and Carlton Goodlett and Victor Rabinowitz, identified members of the Communist Party USA raised funds for the festival in a letter in the April 2, 1962 issue of the National Guardian. Communist-aligned attendees were Charles Berrard, Michael Myerson, Harold Supriano and Michele Hall, daughter of communist Hawaiian labor leader Jack Hall, and future wife of Assemblyman, State Senator, Congressman and California Democratic Party Chairman John Burton (D-CA). Professor Howard Zinn, an identified member of Communist Party USA active in ocmmunist fronts, American Peace Mobilization and New York CP dominated American Veterans Committee, helped recruit attendees to Helsinki confab. On April 28, 1966 Howard Zinn was a sponsor of the Herbert Aptheker Testimonial Dinner. The dinner was held on the occasion of Herbert Aptheker's 50th birthday, the publication of his 20th book, and the 2nd anniversary of the American Institute for Marxist Studies. It was held in the Sutton Ballroom, The New York Hilton, Avenue of the Americas, 53rd to 54th Street, New York City. Most speakers, organizers and sponsors were known members or supporters of the Communist Party USA. Circa 1969, Prof. Howard Zinn, Boston University , was listed as a sponsor of the Socialist Workers Party led GI Civil Liberties Defense Committee . As at February 28, 1969, Howard Zinn was listed as a sponsor of the Massachusetts Committee to Abolish the House Un-American Activities Committee. Daniel Ellsberg first met Howard Zinn at Faneuil Hall in Boston in early 1971, where they both spoke against the indictments of Eqbal Ahmad and Philip Berrigan for “conspiring to kidnap Henry Kissinger.” They marched with the rest of the crowd to make citizens’ arrests at the Boston office of the FBI. Later that spring, they went with their affinity group (including Noam Chomsky, Cindy Fredericks, Marilyn Young, Mark Ptashne, Zelda Gamson, Fred Branfman and Mitch Goodman), to the May Day actions blocking traffic in Washington. New Party News Fall 1994 listed over 100 New Party activists-"some of the community leaders, organizers, retirees,, scholars, artists, parents, students, doctors, writers and other activists who are building the NP" the list included Howard Zinn, historian. Every year since the mid 1960s the Indiana based Eugene V. Debs Foundation holds Eugene Debs Award Banquet in Terre Haute, to honor an approved social or labor activist. 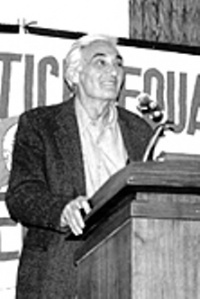 The 1998 honoree, was Howard Zinn. On September 20, 2001 500 people gathered at the CUNY Graduate Center in New York City to celebrate Cloward’s Life and Work. Speakers included Frances Fox Piven, Barbara Ehrenreich, Cornel West, Gus Newport-(all members of Democratic Socialists of America), activists Howard Zinn, June Jordan, Joel Rogers and Tim Sampson plus long time voter registration advocate, Demos president, Miles Rapoport. Since Oct. 26, 2002 when hundreds of thousands of people marched and rallied in Washington and San Francisco against the Bush administration's growing war on Iraq, the government has pretended that nothing happened. The International ANSWER coalition, which called the Oct. 26 demonstrations, is now building new national actions on the Martin Luther King holiday weekend in January. It is also gathering hundreds of thousands of registrations in a referendum against the war, both online and on paper. The group's web site now has a long list of endorsers for the Jan. 18-19 actions that shows the broad social character of this movement. It encompasses groups and individuals from almost every area of activism for justice, equality, peace and a better life for all the people. Key endorsers of the Oct. 26 demonstrations like former Attorney General Ramsey Clark, Rev. Graylan Hagler, Dr. Hans Christof von Sponeck--former director of the UN Oil for Food Program, Bishop Thomas Gumbleton, Mahdi Bray of the Muslim American Society Freedom Foundation, people's historian Howard Zinn and Congressperson Cynthia McKinney Dr. James Tate, Executive Director, National Alliance Against Racism and Political Repression; John Dear, former executive director of the Fellowship for Reconciliation; Attorney Michael Tarif Warren, singer Patti Smith, the Rev. Herbert Daughtry, author Ron Kovic and hundreds more. In August 2004 Howard Zinn a writer and historian endorsed an anti “Bush Team” Protest at the Republican National Convention in New York, organized by Not In Our Name, an organization closely associated with the Revolutionary Communist Party. Howard Zinn was one of 100 "prominent Americans" who signed an October 26 2004 statementcirculated by 911Truth.org calling on the U.S. Government to investigate 9/11 as a possible "inside job". The online newspaper known as FrontPageMagazine (FPM), featured a two-part "dialogue" between conservative radio talk how host and writer Dennis Prager and Howard Zinn, by then a professor emeritus of Political Science at Boston University<ref.What a Fool Believes: Howard Zinn, Part 1, FrontPageMagazine.com, September 12, 2006, www.frontpagemag.com/Articles/Printable.asp?ID=24355, and Part 2, Sept. 19, 2006</ref>. Prager wrote at the end of Part 1 that "a complete transcript and broadcast of this interview will appear on "pragerradio.com". It is well worth reading what Zinn said, in his own words, about America, as well as the way he evaded questions about his often false characterizations of events in American history. Providence - Brown University, November 14 2004? "Teach-In on the War". 4:00pm Howard Zinn, introduced by Evelyn Hu-DeHart, 001 Solomon Hall. Resumes at 8:00pm, List Auditorium, featuring Max Elbaum, Evelyn Hu-DeHart, Sara Mersha, William Keach, Lewis Gordon, emceed by Paul Buhle. In 2008 Howard Zinn signed a statement circulated by the Partisan Defense Committee calling for the release of convicted cop-killer Mumia Abu-Jamal. On May 1 2008, Howard Zinn signed an open letter to SEIU president Andy Stern in protest at SEIU moves force its local United Healthcare Workers into trusteeship. 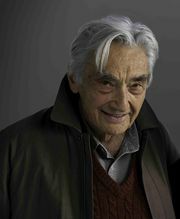 In 2009 Howard Zinn served on the Advisory Committee of the Independent Progressive Politics Network. Matt Damon took part in the The People Speak alongside Howard Zinn and based on his most popular book, A People's History of the United States in 2009. As of 2009 Howard Zinn served as a sponsor of New Politics, a magazine almost completely staffed and run by members of Democratic Socialists of America. Zinn has been a frequent contributor to the liberal magazine, The Progressive. ↑ "Teach-In on the War"
This page was last modified on 19 January 2019, at 23:19.